SPC severe weather outlook for Wednesday & Wednesday night. Sunshine to return Tuesday with warmer temperatures. Strong to severe thunderstorms possible late Wednesday into Thursday morning. Easter weekend looks sunny and pleasant. 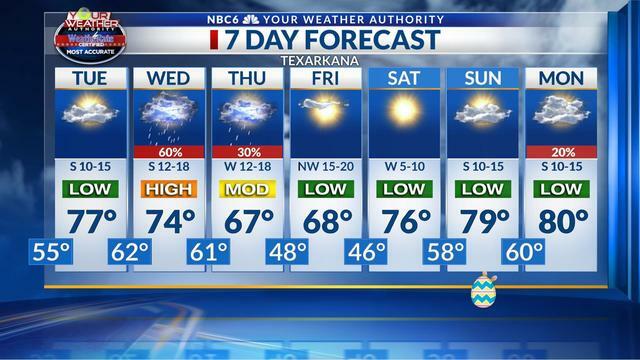 Monday was a mostly sunny and pleasant day around the Arklatex. Temperatures began in the low to mid 40s and climbed into the mid 70s. Expect one more pleasant day Tuesday. We will see plenty of sunshine and a breezy south wind combing to heat temperatures into the upper 70s to low 80s. 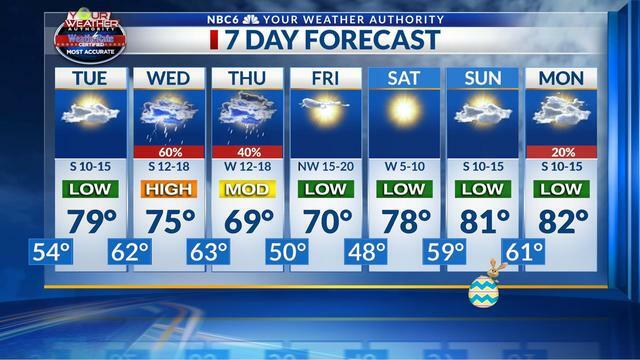 Our streak of pleasant weather will likely end Wednesday. Another strong storm system will approach the area late Wednesday and Wednesday night. Expect a mostly cloudy day Wednesday with a few scattered thunderstorms developing over the northwest half of the area. One or two of these afternoon storms could become severe with wind and some hail as the biggest threats. The biggest threat for severe weather will likely hold off until Wednesday evening and Wednesday night. Strong to severe storms will likely develop to the west of our area Wednesday afternoon. These storms will likely be at their strongest to our west when the will produce some very large hail and damaging winds. A tornado or two will be possible. A line of storms will likely move into our area late Wednesday evening. It will be strongest during this time as it moves into NE TX and SE OK. Wind and hail will continue to be the biggest threats. A tornado cannot be ruled out. This line will slowly weaken as it moves southeast through the Arklatex late Wednesday night. The Storm Prediction Center indicates that we have an enhanced severe weather risk where the line arrives a bit sooner. You can see on the map above that the risk drops off to slight and marginal further southeast. This coincides with the weakening trend that is expected. Some models indicate that we could still have some storms over the southeast half of the area Thursday morning. If we do, expect this activity to move out of our area during the morning. Whenever the storms arrive in the Arklatex, they will likely produce some locally heavy rain. Futurecast indicates that one to two inches of rain will be possible where the storms are strongest over the northwest half of the area. 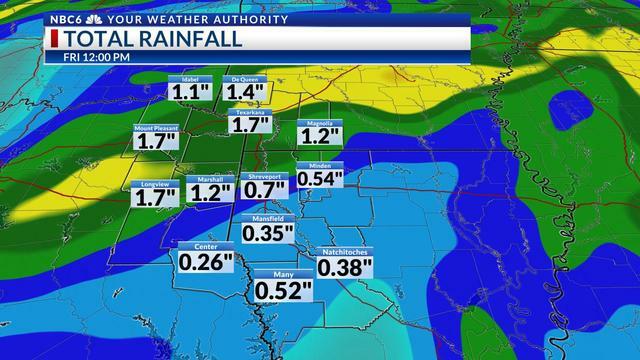 Amounts drop to less than an inch further southeast. The rest of the seven day period looks rather pleasant. That includes the Easter weekend. We'll see plenty of sunshine this weekend. HIghs will be in the mid to upper 70s Saturday and the upper 70s to low 80s Easter Sunday. Average High/Low for today's date: 77/53. 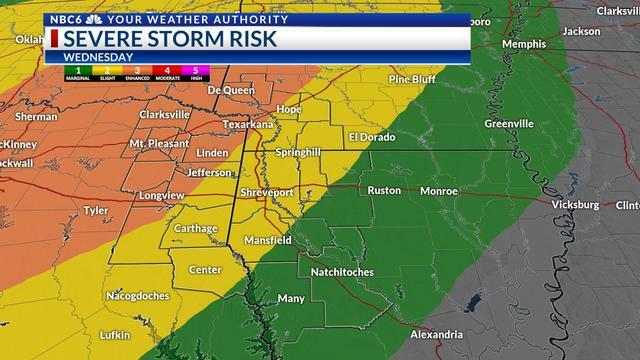 10 a.m. update: Severe weather threat ending, rain continues.